Our 11th Annual Customer Appreciation Day was held on Saturday, August 25, 2018 from 11 AM to 3 PM at the Stahlstown Flax Scutching Grounds. The weather was perfect! The sun was shining and the temperature was great for August. Over 935 customers attended the event making it the biggest turn out yet! The first 500 customers received our annual LHTC Broadband Customer Appreciation Day t-shirt. For those of you have attended since 2007, you have quite the collection of t-shirts! Not only did our attendance increase but so did our local vendors. We had over 15 local vendor’s who participated in our event this year. They add so much to the event and its great for our community to learn about new businesses and activities. G&D Market really made the customers happy with their amazing pizza samples! So, what makes this event so much fun? For us it’s bringing the community together with food, games, and music. It feels like one big family reunion! The Katelyn Rose Band got everyone on their feet and singing along from classic country to today’s hits. And come on who doesn’t love hot dogs, nachos, popcorn and cookies! Then to top it off, B-I-N-G-O!! The kid’s area was a big hit this year! This year we tried something new and added inflatable games like Skee Ball, Basketball, Soccer and Baseball. Plus, we brought the game of all games…Steel City Gamerz gaming bus with all the latest video games! Kids got to try out new gaming systems and new video games, plus they got to enjoy some A/C! And for the kids who wanted to connect with nature, Living Treasures Animal Park brought again this year a petting zoo. So many kids got their faces painted and the balloon art was super impressive. One of the best parts for us was giving away two bikes to two very lucky kids from the door prizes. There were lots of cool giveaways this year like a cell phone ring, water bottle, notebook, and tote bag, plus over 15 door prizes, but the grand prize was what everyone was waiting for at 3:00; 65” Curved UHD 4K Smart TV! A lot of work and preparation goes into this event every year and each year we keep trying to make it bigger and better. We see how much it is appreciated by our customers and we can’t wait to start planning for next year! We thank everyone that makes the day such a success, from our employee’s, to the vendors and sponsors, and of course our CUSTOMERS! 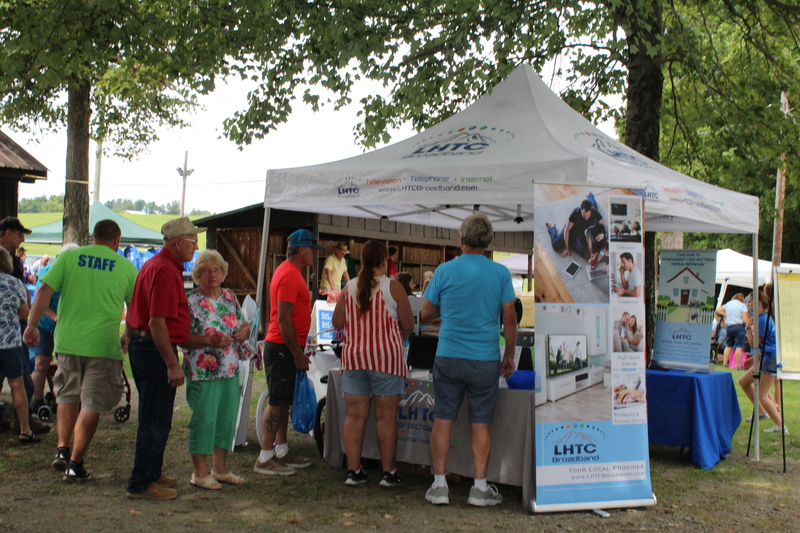 Last weekend LHTC Broadband entered a banner in the Summer in Ligonier Arts & Crafts Show. Ligonier businesses displayed the banners, which all had summer themes. The banners were also used as a Summer in Ligonier Scavenger Hunt to promote shopping in town. Our Marketing team took part in the scavenger hunt and got to experience the unique charm that Ligonier has to offer its visitors. We started at the Ligonier Creamery and we have to say it’s a stop you need to make when in Ligonier! They have the best ice cream treats from hand scooped ice cream to homemade milkshake and even novelty treats. Next, we visited some of the towns local shops which featured everything from stationary to jewelry, new clothes to consignment stores, and gift shops to cafes. In each location was a banner with a specific charm and we had to locate the banner and match the store with the charm on the list. It was a lot of fun and a great way to see all that Ligonier has to offer! Our banner was at Berkshire Hathaway Home Services Office located on South Market Street. 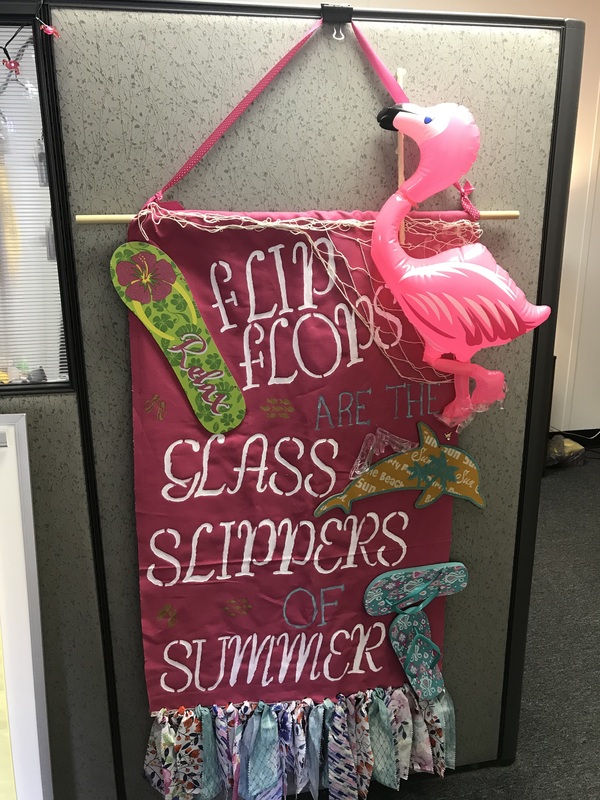 Our banner’s theme was “Flip flops are the glass slippers of Summer”. It featured tiny glass slippers, a pink flamingo, and flip flops! We are very happy to report that our banner took second place in the contest! If you got a chance to see it, we hope it made you smile. If not, here’s a photo! We can’t wait until the next town event. The building will include a customer care center for LHTC Broadband customers to pay bills, pick up equipment, learn about new services, and discuss their accounts with service representatives. The building will have a separate entrance for LHTC Media, Inc., which operates 1480 WCNS & and 910/98.7 WAVL, and, in time, both stations will be broadcasted from the new facility. The new building will be occupied by over 50 employees. Laurel Highland Total Communications, Inc. has grown significantly over the years and is the parent company for fifteen subsidiaries including the telephone, television and Internet operations doing business under the LHTC Broadband in Laurel Highlands, Yukon, South Canaan and Lackawaxen, and six radio stations; 1480 WCNS and 910/98.7 WAVL in PA and 94.3 WRLF, 100.9 JACK, 1490 WBKE, and 920/ 95.7 WMMN in WV. It also owns and operates the Caddie Shak Family Entertainment Center in Donegal. The planning and construction of this new state-of-the-art building will not only help the group of companies operate more efficiently but will also contribute to the economic growth and development of the local communities they serve.